Aerohive’s customer networks contain a wealth of information about the network devices, clients and applications running on the network. While HiveManager leverages this information for targeted network management purposes, there is so much more that our customers and partners can accomplish with it. To this end, the Aerohive Cloud Services Platform includes Insight – a set of powerful APIs that enable enterprises, retail customers, and education organizations to leverage their access network data through customized applications and system integrations. This results in new insights, reduced cost, increased revenue and improved user experiences for customers, employees and business partners. Insight includes APIs for presence, location, monitoring, and identity services that enable a broad range of applications and use cases. The APIs are powered by a state-of-the-art Big Data platform. It collects, aggregates and shapes the network data that so that it can feed the APIs. It is designed flexibly so that it can support different needs for data analysis, for example by features, services or industry requirements. This also ensures that the Big Data platform can evolve to support customers’ and developers’ future needs. Additional information about Insight and the exciting use cases it enables is located here. In addition, the Big Data platform also powers Comparative Analytics, a unique feature included in HiveManager. It can assist network administrators in optimizing network performance. It accomplishes that by letting them benchmark key performance metrics (e.g. average client bandwidth usage or number of clients with poor health) of their own networks against the averaged, anonymized data of other Aerohive network deployments. 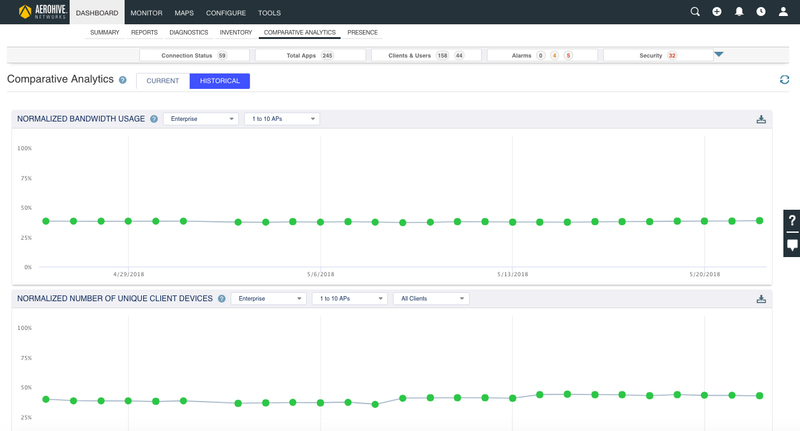 Aerohive customers can access Comparative Analytics through the HiveManager Dashboard.